Installation of Virgin Media Powered Hub Cabinets 1 x 1700mm(H) x 1800mm(W) x 650mm(D) and 1 x 985mm(H) x 535mm(W) x 330mm(D). Is this the start of VM's local roll out to Broadstairs, Ramsgate & Margate? Was VM given a slap on the jaw by over estimating there roll out a few weeks ago even here the rumors of VM being scheduled was rife, they call it fake news these days. Yep. The recent story is nothing to do with these, and roadworks being scheduled are not 'fake news'. That referred to incomplete builds, not completely phantom ones. Hopefully this might be working in 18 months when my contract with TalkTalk expires. Be good to have some real competition. Exactly what I was thinking Stuart. How many of those carbs do they need to cover an area? As at the moment there's only a few showing over the entire area. I presume being fttp. It shouldn't suffer with congestion? Each of those cabinets is for up to 3,000 premises passed. There will be many more distribution cabinets built, along with of course the ducting, over the next months. On your other question congestion is unlikely on FTTP. In fact it's unlikely in new build areas at all due to take up and how they are built. While it may start out using the same technology as the HFC areas, just all fibre with no coax, VM can selectively move to an XGPON solution at their convenience. Heavy customers can be migrated to it to relieve the DOCSIS / RFoG network, followed by everyone else progressively. I understand that at some point in the future the FTTP and HFC areas will diverge slightly as far as what is available goes. Not all VM areas are created equally and holding back some until others can keep up doesn't make commercial sense. Thanks Ignitionnet, that's good to know and I'll keep my eyes open. The ones I've found are all scheduled for June and July. Yes indeed. You'll see tons of works appearing in the near future for the ducts and distribution cabinets. From what I saw of a small sample of those cabinets they were going on permit roads so VM needed to be sure they had something to connect homes to before they start the expensive bit. That part really isn't hard to spot. Thought I would signup to the Kitz forum especially for this thread . As per my heads up on the TBB forum, VM are indeed coming to Thanet in a significant way. It's looking like it's going to be a busy time at work for some of my colleagues!! Welcome to the forums Zico, hopefully all the roadworks won't cause too many traffic issues, but it'll be worth it in the end. I've sent you a PM with some info. With regards to the civils, my colleagues and I are also hoping that things go smoothly. The likelihood of some disruption is probably to be expected but my managers will certainly not be tolerating it. I understand that the VM works in the West of Kent have had a number of issues. Ashford has had a mini expansion of FTTP and there have been a few minor issues which were dealt with. Unfortunately a small minority of the locals kicked up a fuss with comparison of the works to Syria . 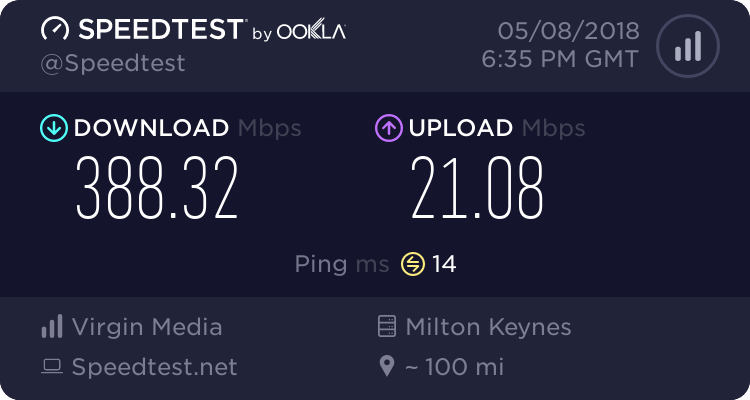 I wanted to post here and clarify that I don't work for Virgin Media so unfortunately, if you are after details regarding other areas outside of Kent, I won't be able to help (and to a lesser extent even within Kent I may not be aware or allowed to pass on certain info I may be privy to). b*cat leaves out some of his kitteh biscuits for Zirco . . . which is one way of saying "Welcome to the Kitz forum." As you might see from my Avatar, I'm a dog man so hopefully there won't be any falling out . **edit** Also just made a small contribution to the forum costs .